Enter a fascinating, ornately drawn cityscape and help a boy find his dragon while counting objects from hot dogs to traffic lights. In the heart of the city, among the taxis and towers, a small boy travels uptown and down, searching for his friend. Readers will certainly spot the glorious beast, plus an array of big-city icons they can count. Is the dragon taking the crosstown bus, or breathing his fiery breath below a busy street? Maybe he took a taxi to the zoo or is playing with the dogs in the park. Steve Light’s masterful pen-and-ink illustrations, decorated with meticulous splashes of color, elevate this counting book (numbers 1–20) to new heights. Maybe the dragon is up there, too! Steve Light is the author-illustrator of many books for children, including The Christmas Giant and Zephyr Takes Flight. He lives in New York City. This unique counting book will be a hit with children who love looking at finely detailed illustrations and searching for hidden items on each page. ... The book is illustrated in pen and ink in a picture-book style that is reminiscent of the late 1950s to early 1960s. The drawings are produced in black ink only, except for the highlighted object on each page. A map on the endpapers outlines the route the boy takes throughout the city. All in all, an excellent offering. Drawn with a fountain pen, Light’s distinctive illustrations have a bold, thick line and deep texture and are highlighted with dashes of color to help identify objects to count. His cityscapes capture the bustle of New York City, and little readers will have as much fun exploring the city as they do trying to spot the sneaky dragon hidden within. A rough map of the city serves as the book’s endpapers, so little eyes can follow along. Expressive line drawings fill the pages of this counting book, a love letter to the streets and sights of Manhattan. ... Light’s creation will appeal to Manhattanites and those outside the borough alike. Black line pen-and-ink drawings in finely patterned detail depict a vital, lively New York City of the imagination. ... Lots for young readers to see and count. The simple journey and even the counting are merely excuses ... to take in the lavish cityscapes of the pen and ink illustrations: each spread features detailed black and white drawings using thick and thin nib techniques to achieve a calligraphic effect. The countable elements are washed over with a single colorful pigment, setting them apart for easy picking out. ... This is one for poring over, so that youngsters can not only count the color-coded hot dogs, balloons, and subway cars but also spot the dragon sneakily hiding just out of our narrator’s view each step of the way. Counting has never been so much fun. Detailed pen and ink illustrations splashed with color will keep young readers engaged as they try to spot the adventurous dragon. Inspired by the steam coming out of New York's manhole covers (which the young author's father said was dragon's breath), Light offers up a winding story of a young boy wandering through a bustling cityscape in search of his dragon. The book does a great job of contrasting intricate black and white line drawings with a bold use of color that will draw kids in, not just to look for the dragon, but to explore the curiosities of the city itself. Lithe and lovely, overflowing with good will and copious details, expect the sentence, “Have you seen 'Have You Seen My Dragon? '” to appear on the lips of parents and children everywhere. Adventure, color, numbers, maps… just a few of the captivating features of this wonderfully fun-for-the-whole-family book. 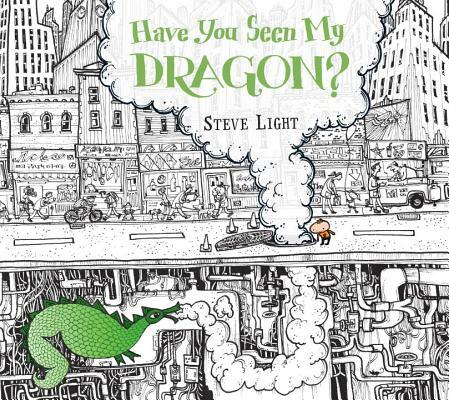 Little ones will love finding the creature in each picture, while Steve Light's intricate drawings of the city will impress readers of all ages. Steve Light's masterful pen-and-ink illustrations, decorated with meticulous splashes of color, elevate this counting book (numbers 1-20) to new heights. Counting has never been so fun!